Up early. Raining leaves by the river. Large camping area above the lean to. Black Dome, Thomas Cole. Looping back, then up Blackhead. Steep descent on north slopes. Views of Wyndham and areas north. Return by lean to. I drove up late at night, sacked out in the car for a few hours, and was up at dawn ready to go. The temperature was below freezing, but the sun was out and I had no trouble keeping warm while I kept moving. The trail climbs steeply, but I quickly found myself at the ridge, looking south at the Indian Head range where I had been just a few weeks before. 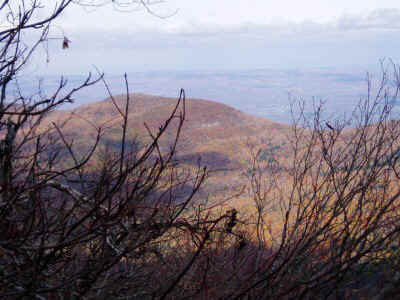 Once on the ridge, it is not far to Black Dome, and to Thomas Cole beyond. 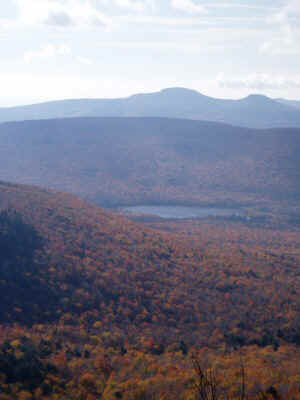 I hiked a good ways on Thomas Cole, to make sure I had actually climbed the peak. I never found a viewpoint or a clear peak, but simply a long flat ridge. I returned, climbed back up Black Dome, and headed for Blackhead. The pleasant weather made the time fly. As I was nearing the top of Blackhead, I crossed paths with another party, who was descending. The trail was getting icy and very slippery. I was at the junction, and the Blackhead peak before I know it. I had a quick snack and hurried on. The trail that descends north from Blackhead is impressively steep. I made a mental note not to ever climb up that way. 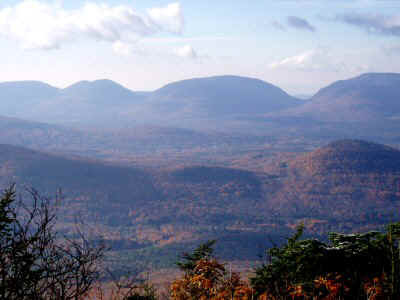 On the way down, there were a few views of the ridge to the north, the northern edge of the Catskills. the fall colors were especially vibrant this year. The steep descent was interrupted by an equal number of flat spots where the dappled sun shone through the trees. 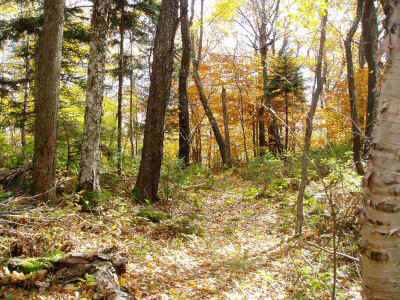 In some areas the trees were completely bare, and in others the leaves were still a mixture of red, yellow, and brown. 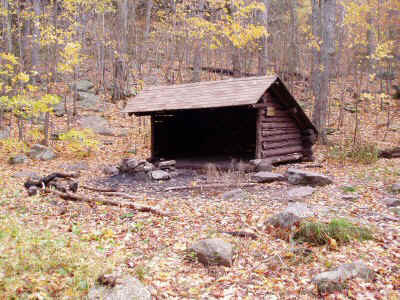 I passed by the lean-to on the Batavia Kill trail. Unlike most, this one seemed relatively clean and inviting. Maybe it is less heavily used than others that are located more centrally.